Browse our full collection of ergonomic office seating, including task chairs, executive chairs, boardroom chairs and more. Our versatile office chairs are fully modular and can be customized to accommodate 100% of the workforce. 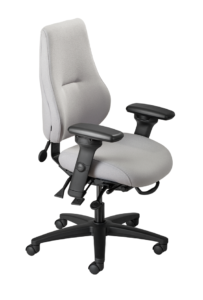 myCentric chairs are designed to hug the user's back, adding stability to the upper body while providing the same exceptional ergonomic support as our other office task chair series. Combining a pleasing aesthetic with a modular design that offers 6 seat sizes, as well as multiple bases, caster and arm options, the myCentric series is ideal for executive, dedicated, and multiple office task applications in a variety of environments. myCentric chairs are designed to hug the user's back, adding stability to the upper body while providing the same exceptional ergonomic support as our other office task chair series. Combining a pleasing aesthetic with modular design that offers 6 seat sizes, as well as multiple base, caster and arm options, the myCentric series is ideal for executive, dedicated, and multiple office task applications in a variety of environments.